It has been a long, busy month. I had a lecture recital exam at the beginning of the month. Then Dublin Feis started and between participating in my own competitions (won one, second in the other) and working for others, it’s been very hectic. Unsurprisingly, I came down with a cold in the middle of it all! Everything finished up yesterday for Easter break. Even though I am working for Sligo Feis the week after Easter, it is still good to have time to myself to regroup and get back to normal. I have been mostly spinning. 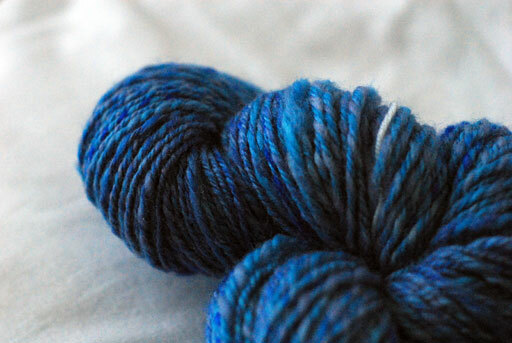 I got 215g of Falkland fibre from Laura Hogan and gradually spun it all up into a DK 3-ply. 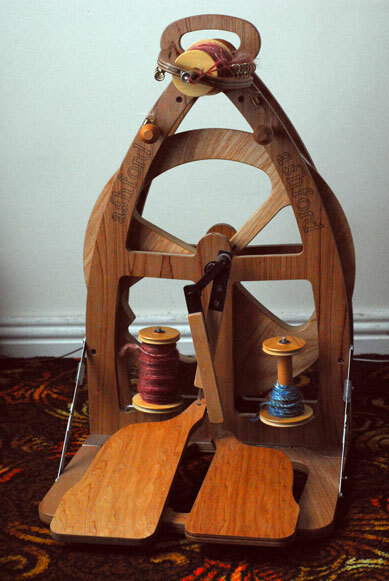 I spun it using a backwards long draw; it drafted really easily and was easy to keep smooth. I plied it using my jumbo bobbin, which worked out great. I was able to fit about 100g on a bobbin. This just would not have been possible on the regular bobbins. The 3-ply turned out really spoingy, I am very pleased with it and quite curious to see what it will be like to knit up. 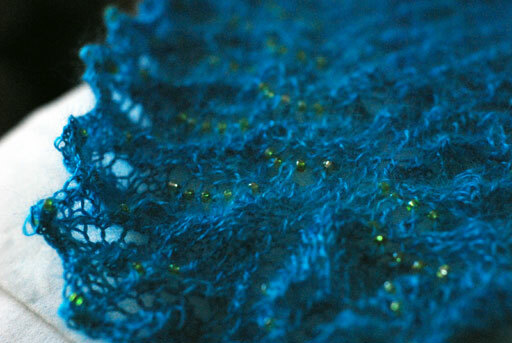 I’ll have to see what sort of yardage I have – I was thinking of making Frost Diamonds with it. Speaking of bobbins, I was so excited about the jumbo flyer, I just had to try out some sort of crazy art yarn. I swung by Beads and Bling on my way home one day and picked up a pile of feathers. 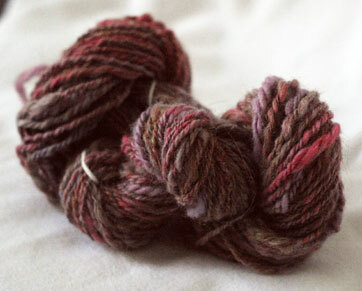 I had a fair bit of leftover undyed Wenslydale so I spun one ply quite finely. The other ply, I didn’t spin at all. When I plied the two together, I stuck the feathers into the thicker, unspun ply and let the fine ply wrap itself around it and secure it. Overall, it was successful and a heckuva lot of fun to do. Maybe I overdid the feathers a bit… but really, can you blame me?! I haven’t been doing a huge amount on the knitting front, mostly because I simply haven’t had sufficient brain space to concentrate for any length of time. I did, however, manage to finally finish off that mohair Swallowtail shawl. I got through a few rows of those nupps – and if you’ve ever knit this pattern, you’ll know what I’m talking about – which involve many, many ‘purl 5 togethers’. It was literally sucking the life force out of me, so I ripped it out and replaced the nupps with beads. Far, far more fun. I haven’t it blocked out yet but that gives you an idea. I just used green beads because that’s what I had lying around but I really like the combination with the colour yarn. I think when I have it blocked out properly, I will post more detailed photos. There were three in my package but I have already spun one up. 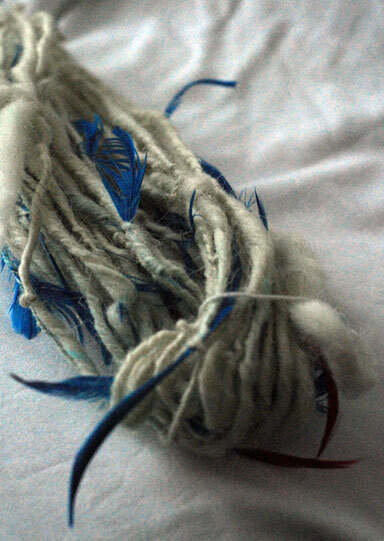 The colours are so varied and so contrasting, I figured the best thing to do was to chain ply it on itself. I haven’t set the twist in it yet but when it’s dry, I’ll show you. It’s pretty crazy looking but I have to say, I just love that hot pink! I hope all of you are having a hot pink weekend and are looking forward to the Easter break as much as I am! On Saturday, the Lilienthals and I went for a trip to Craftspun. They recently opened a new bricks-and-mortar shop in Johnstown. I had heard lots of good things about it but never managed to get down to visit the place. Anyway, a while ago, I ordered some new parts for my wheel and last week, Warren (the owner) called to say that they had come in. I had an exam as well as a recital on during the week so we made a date to go down on Saturday. It was really easy to get to. We took the M50, came off at the Red Cow for the N7 and drove until we saw the sign for Johnstown. It was Junction 7, I think. It took about 35 minutes. Once off the motorway, we drove through the village and there it was. 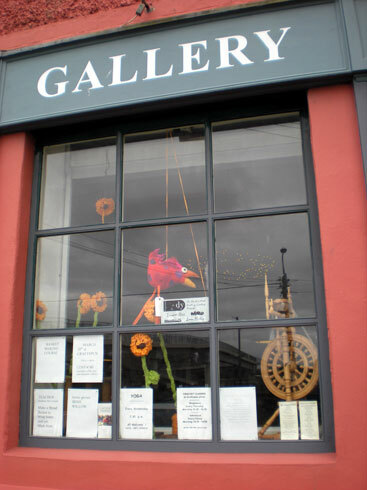 I didn’t get a very good picture of the shop front because there were a lot of parked cars but you get the idea! The parts I’d ordered were a few extra bobbins, because my wheel only came with three, and a jumbo bobbin. When I was spinning an aran weight for my next project, my bobbins kept filling up really quickly and my skeins were tiny – about 40m to 50g. I figured if I went with the jumbo bobbin, I wouldn’t have such a problem and I’d be able to spin some funny art yarns as well. I haven’t tried it out yet but I’ll let you know when I do! Anyway, Laura and I had a great time chatting to Warren and looking around the place. He was so generous; he gave me some fleece samples from fleeces that had been dropped into him in the shop. One was from a freshly shorn lamb – it’s very fluffy but will need a wash. Another was from a cocoa-coloured alpaca that had been shorn with a scissors. I will show pictures of both when I get a chance, and talk more in detail about them. I got some ‘regular’ Wenslydale tops to keep me going, as well. 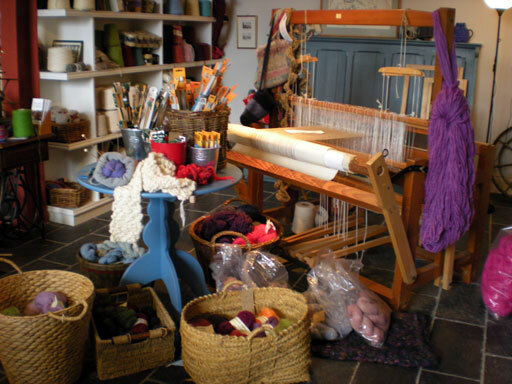 Truly, it is a fibre enthusiasts shop with samples of felting, weaving, spinning, knitting, crochet lying all around. 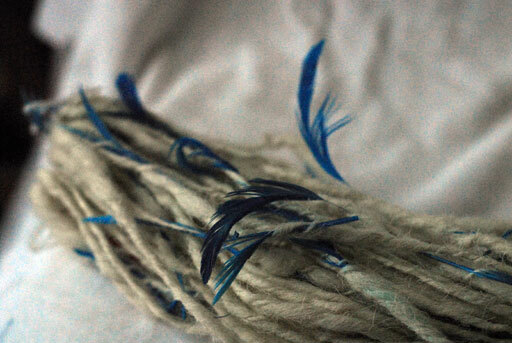 It is so nice having a supplier of natural fibres in the area! By the time we were finished, it was lunchtime so we went on to the Kildare Outlet Village for a bite to eat and a mooch around the shops. All in all, a fruitful expedition that I had looked forward to all week (exam and recital both went reasonably well, thankfully!). Thanks again to the Lilienthals for accompanying me! This week has been a bit nutty because I had a lecture recital exam on Wednesday and was playing for another recital yesterday. So I have been working on some small spinning projects. I can’t remember if I told you but I decided to join up to Laura’s Batt Club! Exciting stuff! I got my first installment on Monday. 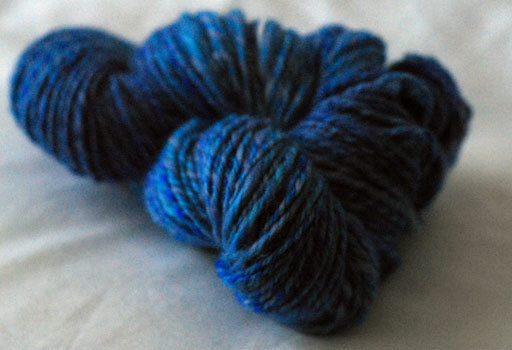 It’s a mix of blue faced leicester, merino, alpaca, fawn alpaca, mohair and angelina (I think!). 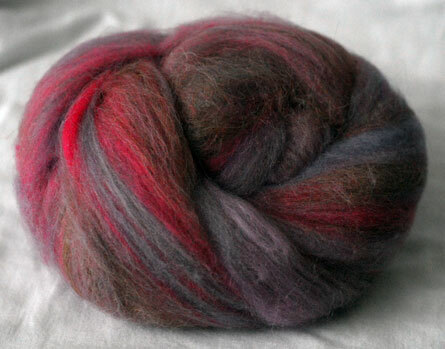 It’s a colourway I would never have picked myself but I quite like it and am really interested to see how it spins up. 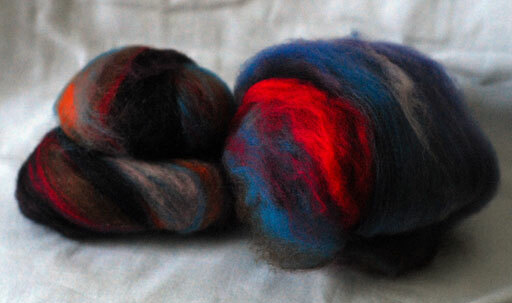 Laura also sent me a really delicious sample – 45g of fawn alpaca and hand dyed merino, carded twice. This was so beautiful that when I got home from my exam on Wednesday, I set to and spun it right up. It is delicious! 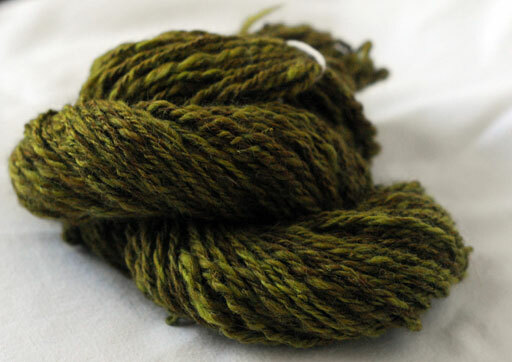 I spun a fairly fine single woollen style from wee rolags and then navajo-plied it into a 3-ply. My navajo plying has left a lot to be desired so I posted a question on the Irish Spinners Group board on Ravelry, wondering how I could get the lumps and bumps out. Laura responded with a really good youtube tutorial. I tried it out last night on some other stuff I was working on yesterday and it works a treat. 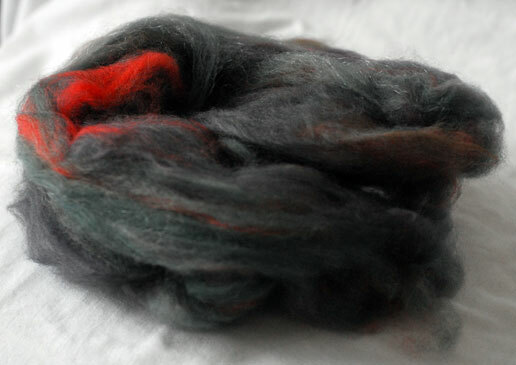 50g of a 2ply sportweight, 100% merino. Love the dark colours. I think maybe I’ll make it into mitts. 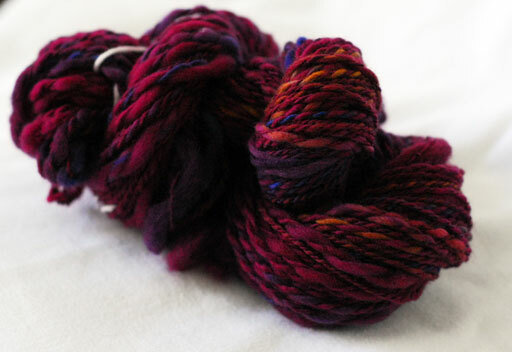 I also found a lot of what I think is a blend of merino and silk. I picked it up in Chicago two years ago too. It’s about 100g of double knit. It’s a little over-plied and I have to say, I don’t like it very much. It’s not as soft as it was before I spun it up, which doesn’t make any sense to me. Maybe it’s because it’s a bit overspun. Anyway, I have a very nearly finished Stilwell jumper and a garter stitch shawl that made a lot of progress last night while we watched War of the Roses. 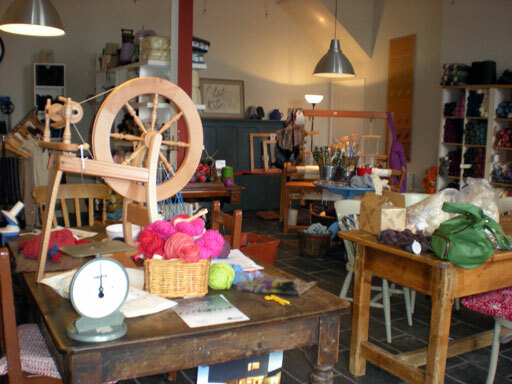 Tomorrow, I’m off with the Lilienthals to Craftspun to pick up some spinning supplies and generally have a day out. Have a good Friday everyone, and a lovely weekend!